So I was out shopping the other day and I saw this amazing palette by Revolution in Superdrug and I just had to tell you guys all about it. I've been a big lover of revolution for years now and I've got quite a collection of their palettes but this one is definitely up their with Flawless as one of my favourite palettes. 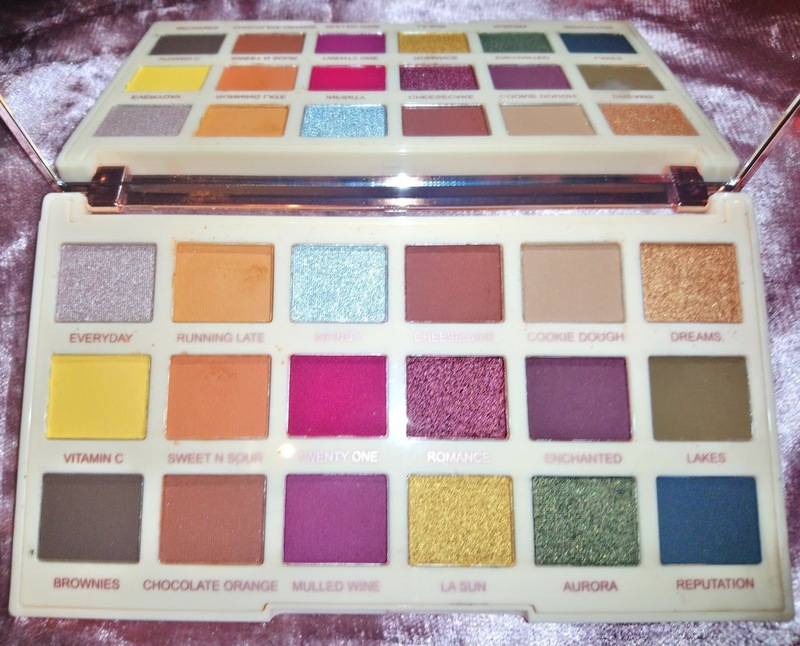 This palette is priced at £10 from Superdrug. I can't find it on their online store but I have found it on beautybay for the same price. The packaging is this lovely reflective rose gold colour and the palette itself comes with a gorgeous array of shimmers and mattes and the names for the shades are so inventive I just can't. The palette comes with a mixture of highly pigmented shimmers and mattes. The palette spans quite a lot of the colour spectrum so you can really play about and be experimental with different looks which is the best feature of the palette. I'm excited to try out shades like LA Sun and Reputation. My favourite shades are running late, sweet n sour and romance. I'd definitely recommend this palette for anyone make-up lover or newbie looking to start out their collection. It would also make an ideal Christmas gift. The colours in this palette!! I'm normally someone who uses very natural tones but I love the look of this, might have to try and have a bit of an experiment with them! These colors are so vivid and pretty! Love the mix of shimmer and matte. Great post! I absolutely love her highlighter palette, but I still haven't picked this palette up - I believe it's vegan! I always heard about this brand. People really like it, very popular and blog posts reviews. My sister likes makeup and this would be affordable to give her as a nice stocking stuffer. The colours are just woow😍😍i love them. Great review! I have actually never heard of this palette but I am loving the variety of colors and it looks so pigmented! Love it! I have the extra spice palette by Soph and it has some of the same shades! Great review and pictures lovely colours!!! I love Revolution, I think they have such high quality makeup for the price. I also love that they collab with influencers, Soph's palettes are gorgeous. I love the variety of colours in this, perfect for Christmas party season! That palette is stunning!! How much was it? Defo need to get it! Wow that's such a pretty pallet, and thanks for the review. I think I'll pick it up soon and see if it shows up well on my skin tone. I need to be more adventurous and try some of these fun colors!!! I love all the colors, they are so bright! These colors are so fun! that pigmentation looks amazing as well!